Only two countries are left standing in the 2015 FIBA Asia Championship. 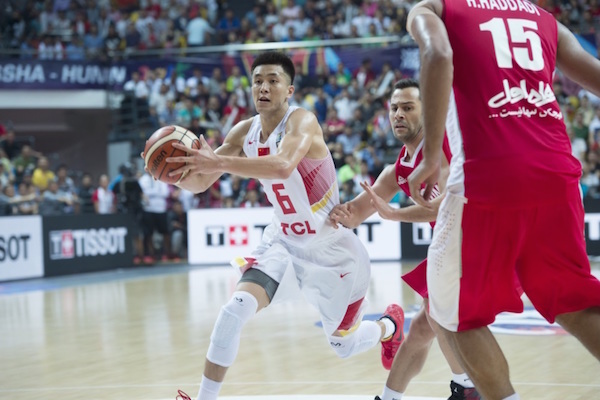 Rivals on and off the court, China and the Philippines are expected to figure in a fierce battle for the continent’s lone outright ticket to the 2016 Rio Olympics. Japan and Iran, meanwhile, dispute third place. Hong Kong hung on for the entire game here, but Kazakhstan just proved too good and finished at eleventh place. Pavel Ilin scored a game-high 29 points to lead the Kazakhs, who earned just their second win of the tournament. He was backstopped by Anotliy Kolesnikov’s 11 points and 9 rebounds, while Dimo Klimov added 10 markers. Wong Chun Wai paced Hong Kong with 23 points, while Duncan Reid and Lee Ki scored 14 and 13 respectively. Middle Eastern neighbors Jordan and Palestine disputed ninth place yesterday, and the former prevailed quite convincingly. Big man Mohammed Shaher Hussein imposed his will underneath with 29 points and 9 rebounds, while veteran Zaid Abbas contributed a 21-points, 12-rebound double-double. Wesam Al-Sous also waxed hot here, hitting 5 treys en route to 16 points. Palestine drew most of its production from the big three of Jamal Abu-Shamala, Sani Sakakini, and Imad Qahwash, who tallied 55 points total. The Koreans didn’t run into rough weather in trouncing the upstart Indians. Coach Kim Dong-Kwang’s wards caught fire in this match, hitting 10 triples. Cho Sung-Min, Lee Jung-Hyun, and Choi Jun-Yong each hit at least 2 threes to stretch India’s defense. With the exception of Moon Seong-Gon, all the players fielded in by coach Kim scored in double-figures, led by Moon Tae-Young’s 22 markers. Twin towers Amjyot Singh and Amrit Pal Singh paced the losing side with 24 and 18 points respectively. Lebanon got some payback in this one, scraping by Qatar to stay alive for a top five finish. Earlier in the competition, Qatar beat Lebanon in a double-OT thriller, but this time it was Lebanon who made the bigger plays in the endgame. Amir Saoud split his freebies and Bassel Bawji hit a put-back to give the Lebanese the marginal difference. Young gun Wael Arakji led the way for the Cedars with 21 points, 5 rebounds, and 5 assists, while Bassel Bawji impressed with 18 points and 7 boards. Trey Johnson paced Qatar with 29 points and 10 rebounds in the loss. 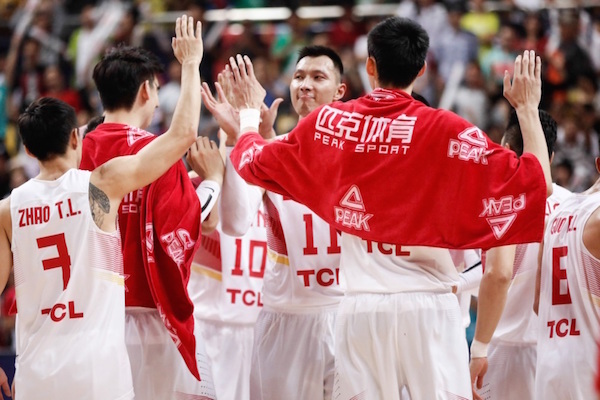 China stamped their authority on the FIBA Asia Championship by dethroning Iran and clinching a spot in the Final. Rolling to an eighth victory in as many games, China spread their points around and led from start to finish as they ended the title defence of the Iranians. Gong Luming's side raced into a 21-12 lead by the end of the first quarter and kept the pressure on Iran, who had won three of the last four Asian Championships, but showed their vulnerability in a defeat to the Philippines earlier in the tournament. If Iran were going to have a chance in this game, they needed to get some production on the perimeter, but the team finished a woeful two of 16 from three-point range. 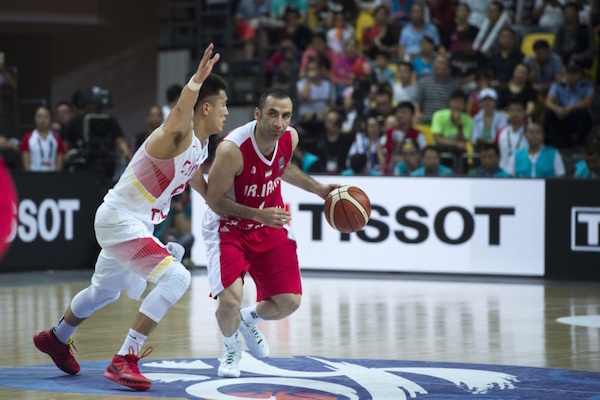 China are now just one victory away from a spot in the Rio de Janeiro Games while Iran, who will play in the third-place game, will take part in one of the three FIBA Olympic Qualifying Tournaments (OQTs) next year. Yi Jianlian had 13 points, 8 rebounds, and 4 blocks. Guo Ailun was a playmaking wonder for China. Mahdi Kamrani and the Iranians fell short of being able to defend their crown. The Chinese remain the only unbeaten team in the field. 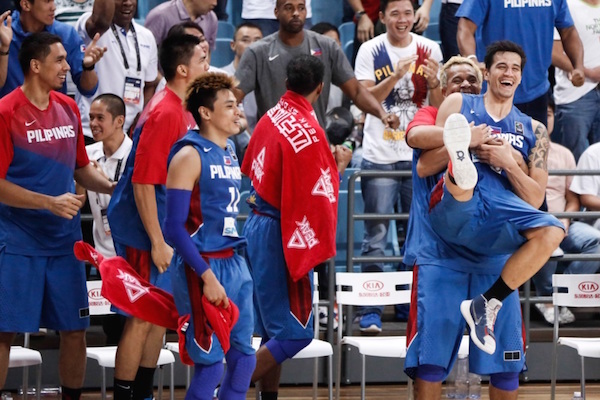 The Philippines had to pull out all stops but beat still Japan to reach the Final of the FIBA Asia Championship for the second consecutive time. With Jayson Castro and Andray Blatche again supplying plenty of points, rebounds, assists, and energy, the Philippines also got a shot in the arm from several others to see off a Japanese team that played with tremendous resolve and at times looked like a side that would go on to win. Philippines captain Dondon Hontiveros hit a tournament high six three-pointers, including three in the fourth quarter, to help Tab Baldwin's side. If he was the X-factor, Ranidel de Ocampo and Gabe Norwood were close seconds. De Ocampo had seven rebounds and two steals to go with his eight points and Norwood excelled defensively, coming up with a couple of steals and a block to go with five rebounds. Japan's Makoto Hiejima had 28 points - 22 in the first half - but the Far East side wasn't able to set up a Final showdown with China. Jayson Castro was the Philippines player who held his team together for the first three quarters with his solid, gutsy play. He finished with 20 points, seven assists and two steals. 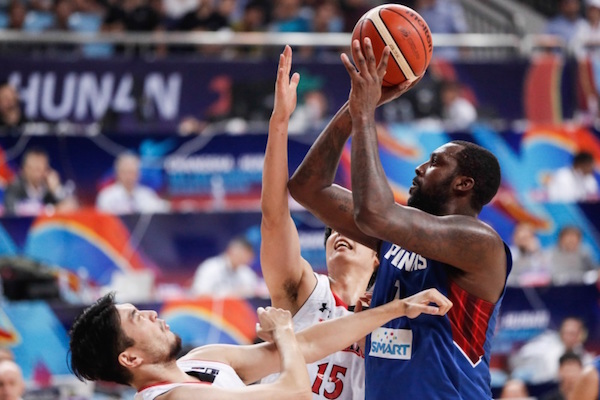 Andray Blatche rises up over two Japanese big men. The Filipinos celebrate their second straight appearance in the tournament Final. 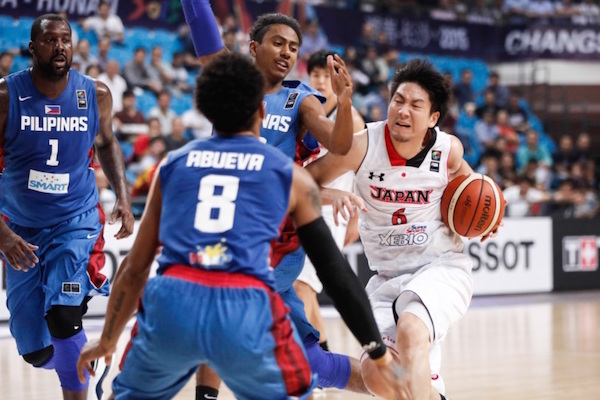 Makoto Hiejima's brilliant outing went for naught as Japan fell to Gilas Pilipinas.